Auction markets have remained resilient, with both volumes and the preliminary clearance rate rising week-on-week. The strong auction results add some complexity to speculation that the housing market is moving through its peak rate of growth. At face value, auction markets are continuing to indicate continued strength in selling conditions across Sydney and Melbourne, however it’s harder to know whether vendors are adjusting their reserve pricing in order to clear their property. There were 2,376 auctions held across the cities this week, with a preliminary auction clearance rate of 76.2 per cent. Last week, a final clearance rate of 73.0 per cent was recorded across 1,689 auctions. Over the corresponding week last year, auction volumes were lower than this week, with 1,876 properties taken to auction and a clearance rate of 69.5 per cent. Melbourne had the highest number of auctions this week, with 1,092 properties going to market, with a lower preliminary rate of clearance week-on-week (76.8 per cent), however Sydney saw the largest increase in volumes over the week, with 938 auctions held across the city, increasing from last week’s 592. Final auction clearance rates are published on Thursday and it will be important to monitor whether preliminary clearance rates undergo some revision as more data flows through. In Melbourne, Australia’s largest auction market, a preliminary auction clearance rate of 76.8 per cent was recorded across 1,092 auctions this week. Last week, Melbourne’s final clearance rate was recorded at 77.5 per cent across 792 auctions, while this time last year, 871 properties were taken to auction across Melbourne and a clearance rate of 71.3 per cent was recorded. The busiest Melbourne sub-regions this week were Melbourne’s Inner region and the Inner South region, where 217 and 163 auctions were held respectively. In Sydney, 938 auctions were held this week, up from 592 over the previous week. The preliminary clearance rate of 79.4 per cent is up from 73.8 per cent last week, and also higher than this time last year, when a clearance rate of 76.2 per cent was recorded across 647 auctions. Looking at the sub-regions of Sydney, the Northern Beaches region recorded the strongest clearance rate of 91.4 per cent across 94 auctions, while the North Sydney and Hornsby region had the highest volume of auctions (148). There were 127 Brisbane homes taken to auction this week, with 76 results reported so far. The preliminary clearance rate for the city is 61.8 per cent, up from 59.6 per cent last week and higher than one year ago, when just 49.3 per cent of the 151 properties taken to auction were successful. Across the Gold Coast 25 results have been reported so far, with a success rate of 32.0 per cent. This week, Adelaide saw a preliminary clearance rate of 71.8 per cent, with 71 reported results across a total of 100 scheduled auctions. In comparison, over the previous week Adelaide’s clearance rate was 62.5 per cent and 66.3 per cent one year ago. There were 31 Perth auctions this week and so far 14 results have been reported, with 42.9 per cent selling. Last week there was a 43.8 per cent clearance rate for Perth. Across Canberra a total of 79 auctions were held this week, compared to 58 last week and 52 at the same time last year. 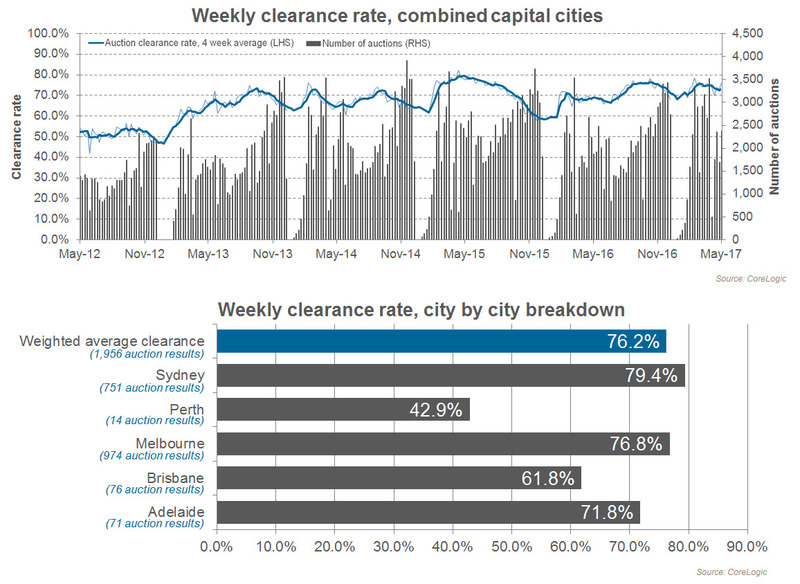 Canberra’s preliminary clearance rate of 75.8 per cent is higher than it was the previous week (64.7 per cent). Of the 4 Tasmanian auction results reported so far this week, 2 sales have been recorded.